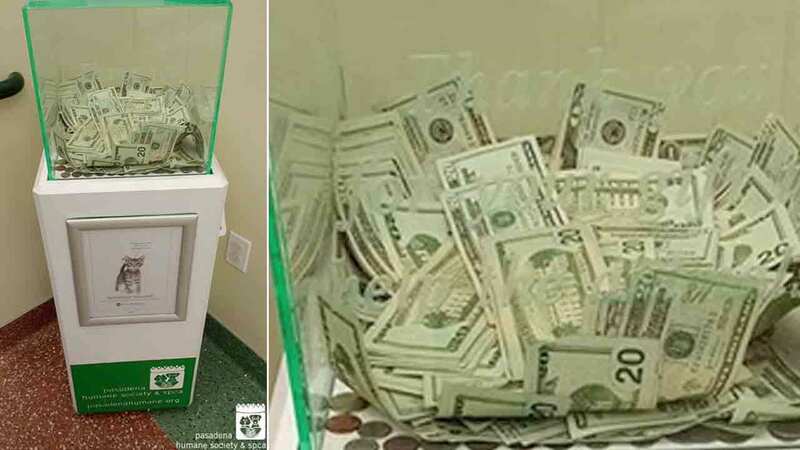 PASADENA, Calif. -- An anonymous donor dropped $8,000 in cash at the Pasadena Humane Society and SPCA, and volunteers are ecstatic. The generous person dropped the hefty pile of money, all in crisp $20 bills, in a collection box at the Neely Cat Center Wednesday morning. The animal shelter said it is truly grateful to the kind person who made the donation, and who still has not come forward, and would like to say thank you on behalf of all the animals at the Pasadena Humane Society. The Pasadena Humane Society and SPCA's Wiggle Waggle Walk, a fundraiser that benefits the shelter and its animals, will be held at the Rose Bowl on Sunday.